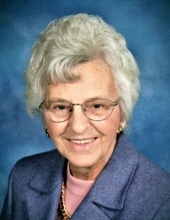 Joyce Goodin Powers, age 86 years, 4 months, and 17 days of Williamsburg, Ky., departed this life to be with the Lord on Wednesday, March 20th, 2019 at 12:47 am. She passed away peacefully at her home surrounded by her devoted family. Joyce was a 72-year member of Main Street Baptist Church and a retired employee of Williamsburg Health and Rehabilitation Center. Joyce, born on November 3rd, 1932 in Williamsburg, Ky., was the daughter of the late Oscar and Clara Brooks Goodin. She was preceded in death by her parents, Oscar and Clara Goodin, husband, Pairon Powers, brothers, James and H. T. Goodin, Sister, Euna Marlene Stephens, and granddaughter, Deborah Randles-Childress. She is survived by her adoring and devoted children, James A. Powers and wife Beckie, Marlene Sharp and husband Troy, Roger Powers and wife Linda, Steve Powers and wife Sheila, Carlton Powers and Ennie Mahan, and Jonathan Powers and wife Diane, one sister, Wilma Reynolds, all of Williamsburg, Ky., one special nephew, Billy Stephens and wife Jennifer, 2 sisters-in-law, Daphne Goodin of Corbin, Ky. and Georgia Powers of Williamsburg, Ky. and by her grandchildren Marjorie Cecil (Steven), Jennifer Mays (James), Brenda Caddell (Jason), Jamie Solis (Junior), Matthew Powers (Nevelyn), Ciera Swords (Eric), Leah Powers, Leslie Croley (Tim), David Powers (Brittany Sawyers), Jason Powers (Kandice), Chris Powers (Sylvia), Chase Powers, Joshua Powers (Shonda), Hope Wright (Alva), and Monica Nighbert (Brad), 26 great-grandchildren, 2 great-great-grandchildren, along with a host of loving nieces, nephews, cousins, other relatives, and close friends who mourn her passing. Joyce treated everyone with kindness and respect and loved everyone like family. She always made sure no one left her home without enjoying a home-cooked meal and a one-of-a-kind hug. She was a very special and loving mother, wife, daughter, sister, relative, and friend who will be missed by everyone who loved and knew her. Visitation will be held at the Ellison Funeral Home on Saturday March 23rd, 2019 at 5:00 pm in Williamsburg, Ky. The funeral services will be conducted on Sunday March 24th, 2019 at 2:00 pm at Main Street Baptist Church in Williamsburg, Ky. with Dr. Jerry Lowrie and Rev. Bill Wright officiating. Interment will follow in the Whitley Memorial Gardens in Williamsburg, Ky.
To send flowers or a remembrance gift to the family of Joyce Goodin Powers, please visit our Tribute Store. "Email Address" would like to share the life celebration of Joyce Goodin Powers. Click on the "link" to go to share a favorite memory or leave a condolence message for the family.